I decided on the Estes Alpha kit for the rocket - a classic, basic first kit for kids to build, which comes in educator bulk packs. Tomorrow, I begin building the wind tunnel. This is going to be a lot of fun. The Big Dog is looking really good at this point. Now it's time to attach the rail buttons and take care of a few final details. If you're just tuning in, rail buttons are used instead of launch lugs on a lot of larger rockets. This rocket isn't huge, so rather than the big, 1010-sized rail buttons often used on high power rockets, I'm using the newly-developed micro buttons. With these buttons, you can use an aluminum extrusion of t-slot rail instead of a launch rod. A rail is a lot stiffer, so you can use a rail that's much longer than a rod you'd have to use, and it won't bend, or whip. Why would you need a longer launch rod or rail? Some rockets lift off slowly. And some rockets are what is known as overstable. Without getting into it too much, I'll just tell you that when an overstable rocket lifts off slowly, it is much more prone to arching into the wind - a phenomenon known as weathercocking, and you won't get a straight flight. All rockets do this to some extent, but an overstable rocket will do it much more so. You can end up with a rocket flying horizontally, which is undesirable, because once it runs out of propellant, it will take a nose dive at the ground. 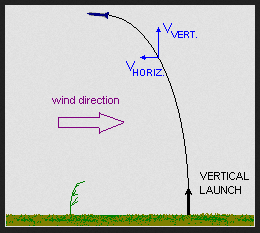 If the parachute manages to deploy before the rocket impacts, it will likely cause a jagged rip in the side of the rocket, known as a zipper. You can minimize weathercocking by having a longer launch rod or rail. As a rocket accelerates, it "feels" less of the wind coming from the side, and more of the wind coming straight on. The faster a rocket flies, the less of a problem overstability will be. I have a number of rockets which are technically overstable, but the only one that really suffers from bad weathercocking is the Big Bertha - because it lifts off slowly. Using a longer rod or rail means that the rocket will be going faster when it leaves the launch pad, because it will have more length to accelerate. The disadvantage of a longer launch rod is that it can sometimes suffer from wire whip. When a rod is too long for its diameter, it can whip back and forth as the rocket moves upward, and can throw a rocket off course. A launch rail won't do that. The micro buttons are made to fit a couple of miniature t-slot extrusions currently on the market - the MakerBeam and the OpenBeam. Micro buttons are made of nylon and come in two parts: A small, #2-sized screw, and a sleeve with a flat, washer-like bottom. The flat part goes against the rocket. All you need to do is thread the screw all the way into the holes you've drilled and make sure the screw is tight enough so that the base is flush with the rocket. If the holes you drilled are a little small, it might be a little tight at first, but that's OK. If you have a rail button that's a little loose, you can mix up a small amount of epoxy and use a toothpick to apply a tiny ring of it to the inside of the hole. Once the epoxy has set, you're done. The next step might be to tie the shock cord to the nose cone. But before doing that, I'm going to add something - a parachute protector. This is a square of flame-retardant Nomex fabric, and it helps add insurance against burning holes in the chute when the ejection charge goes off. Nomex comes in different-sized squares for use in different-diameter airframes. The shock cord gets threaded through a button hole in one corner of the cloth. Some people use this in place of recovery wadding, but it's really best used in addition to wadding. Nomex is not burn-proof, and it will get holes in it after a flight or two. But used in conjunction with wadding Nomex can help keep your parachute safe and burn-free. The first step is to thread the shock cord through the button hole found in the corner of the Nomex cloth. Many people tie this in place to keep the Nomex square from sliding all the way up and restricting the parachute shroud lines. A simple knot might work, or running the shock cord through the button hole a second time. Next, tie the nose cone to the shock cord. When I built the Big Bertha, I used a buntline hitch. This would probably be fine, but after reading a tip on both Chris Michielssen's Model Rocket Building blog, as well as Rich's Rockets, I've been using the Uni Knot - also called the Duncan Knot. This is basically a type of noose, and it's easy to tie and pretty secure - once you've got it properly tightened. I find that the cloth elastic of the Big Dog shock cord makes the Uni Knot easy to secure, and it looks neat. Tie the nose cone on and snip off the excess end of shock cord. The final step to building the Big Dog - and making sure it's flight-worthy - is to check the center of gravity, often abbreviated as CG. This has to do with stability. I haven't addressed stability much in this blog yet, but here's a really basic primer. The center of gravity - CG - is the point on a rocket - or any object - around which the rocket will rotate in space. If you took a model rocket and flipped it end over end, it would rotate around the CG. The CG is also sometimes called the center of mass or the balance point. You can find the CG by balancing the rocket on the back of a chair or any thin object until you find the spot where the rocket balances. Center of pressure - or CP - is the imaginary point on the rocket where all the aerodynamic forces are in balance, and it has to do with the overall surface area of the rocket. While the center of gravity can differ depending on the relative weight of various components - the nose cone, the density of the fillets, how much glue you had to use to secure the motor mount - as well as the relative position of items - how far forward the shock cord mount is glued, for example - the center of pressure doesn't change with the mass of these objects. It's all about surface area. Without going into too much detail for now, I'll just say that the basic principle is that the Center of Gravity must be forward of the Center of Pressure, by a distance equal to at least the diameter of the airframe - the ideal caliber stability is between 1-2 times the airframe diameter. Some people find this surprising, and we'll go into this in more detail in a future post, but if you're new to rockets, for now, just trust me - this is a fact. CG is forward of the CP by 1.96 times the diameter of the airframe. That's what "1.96 caliber stability" refers to. Having a CG more than 2 times the diameter forward of the CP is overstable - and is usually acceptable. Less than 1 diameter is marginal stability, and is generally not good enough. According to the kit instructions, we need to make sure that the CG is sufficiently forward of the CP for the Big Dog to fly in a stable manner. This is because with a larger 29mm motor mount, we could use one of any number of motors, some of which weigh a lot more than others. So we have to find the center of gravity - that is, the true center of gravity - for the rocket as it will be on the launch pad. To do that, we have to fully prep the rocket for launch, with the parachute, wadding, and motor installed. The best practice here is to install the heaviest motor you plan on using. The motor will shift the CG rearward. I built the Big Dog to hold composite motors, which have thrust rings built into them. I don't have any composite motors on hand, but I do have some 29mm Estes black powder motors, which are pretty heavy - probably heavier than the composites I would use. The Estes F15 is the heaviest motor I have on hand. As you can see, the F15 is a simple cylinder. There's no thrust ring. How do we use this in a rocket with no internal thrust ring, and with a screw-on motor retainer, like we've built here? We'll make a thrust ring, using masking tape. This works quite well. 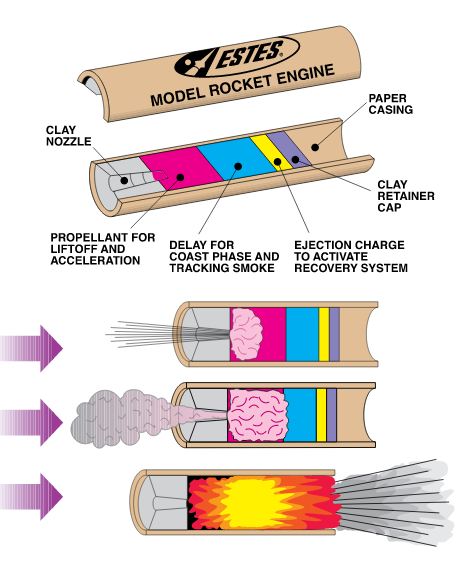 The NAR Model Rocket Safety Code expressly prohibits altering or tampering with a motor, but adding tape to the outside is acceptable. First, we'll tightly wrap tape around the very aft end of the motor, until we have enough thickness to hold the motor in place. This takes a lot of tape. This looks messy, but we're going to trim the excess. With a hobby knife, taking care not to cut into the motor casing itself, trim off the overhanging tape. Now we have a 1/4 inch thrust ring which is quite secure. Insert the motor into the rocket and screw the motor retainer in place. Next, we'll install the wadding, Nomex and parachute. 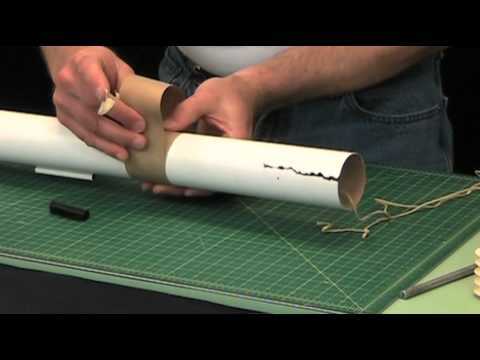 You could use paper wadding - the kind that looks like toilet paper - as you might with a smaller model rocket. But you'd have to use a ton of that stuff, and it's expensive. I don't use paper wadding on any of my rockets any more. Instead, what a lot of rocketeers use is paper cellulose insulation. This stuff is sold by the baleful at Lowe's and Home Depot, and it's really cheap - and flame retardant. It's meant to be blown into attic spaces for home insulation, but it's great for rockets. Rocketeers commonly refer to this stuff as "dog barf." Instead of tying the parachute directly to the nose cone - which makes it hard to get untangled after a couple of flights - I always use a fishing snap swivel to hook the parachute to the nose cone. With a larger rocket like this, I decided to get heavier-duty snap swivels. For heavier rockets, I might switch to something like a quick link, but the Big Dog is still pretty lightweight, so a sturdy snap swivel should do the trick. Thread the shroud lines through the eye of the swivel, creating little loops. Then pass the loops over the snap end and pull them tight. Then all you have to do is attach the snap to the nose cone. Next I added the wadding. You want a layer of wadding of probably a depth equivalent to twice the diameter of the airframe. With the Nomex, you can probably get by with less, but that's a good depth to shoot for in general. Some people fold their parachutes in the Nomex chute protector, burrito-style. This Nomex square was a little small for that. Others simply ball the Nomex up and stuff it in the tube, though some people report chute damage doing it that way. I went for a compromise. First, I stuffed the Nomex partly into the tube, flatwise. Next, I folded the chute as I would do with any rocket. I laid the shock cord into the little pocket created by the Nomex and placed the chute into that basin as well. That way, I had Nomex surrounding the chute on all sides, with only the top exposed. Finally, I put on the nose cone. To find the CG, you simply need to balance the rocket on something thin. The back of a chair will work just fine, or a ruler - if you can keep it steady. Whatever you use, it's important that it not move. You're going to have to balance the rocket perfectly, which takes some careful adjustment, and if the object on which you're balancing the rocket is moving at all, you may never get it. I used the edge of a tube cutting jig I made. The positions of CG and CP are usually measured as a distance from the tip of the nose cone backwards. But the nose cone is curved, and that can be tricky to measure. To make it easier, the kit instructions say that the center of gravity should be no less than 8 inches from the rear of the airframe. My CG was just at 8 - maybe more, maybe less. To be safe, according to the instructions, I should probably add a little weight to the nose cone to shift the CG forward a little bit. It's hard to get an accurate measurement and take a picture at the same time with one hand and a metal ruler. In all honesty, I'm a little skeptical that the CG needs to be that far forward. The Big Dog has huge fins, and 8 inches up the airframe is pretty far forward for the CG, compared to the CG/CP proportions on other rockets I've built. Sometimes I find it easier to switch to the metric system, and this is one of those times. The units are smaller, and divisible by ten. So the 24 inch long airframe is 61 centimeters long, and at 1.97 inches in diameter, it's exactly 5 centimeters. If the CG has to be 8 inches from the aft of the airframe, that's 20.32 centimeters. The center of pressure on this rocket is 62.5 centimeters from the tip of the nose cone. Subtract the length of the nose cone, and it's 52.66 centimeters back from the forward end of the airframe - or 8.34 centimeters from the back end. That's 3.28 inches from the read end of the vehicle, not counting the fins (remember, the kit has us measuring the CG from the aft of the airframe). To get a minimum of one caliber stability, the center of gravity must be 13.34 cm from the back end. That's 5 cm ahead of the CP. And that's about 5 and a quarter inches from the back end - not 8! But, as I was writing that last bit, I noticed a little flaw in the sim - the nose cone. Remember, the Big Dog has a tangent ogive nose cone, but it doesn't come straight out of the body tube like that. There's a short cylindrical section which is part of the nose. OpenRocket, and perhaps RockSim as well, doesn't allow you to make a nose cone of that shape, so far as I know. But the rocket in the sim is shorter than the actual Big Dog we've built. The short body tube section I added to simulate the base of the nose cone is red, like the nose cone itself. The actual airframe - made of a paper wound tube - is white. Now the rocket is the correct length. With the rocket being slightly longer, the CP does shift forward a little bit. How much? It's now 67.5cm from the tip of the nose cone. That's now 8.84cm from the base of the airframe, or 3.48 inches. The CP needs to be ahead of the CG by a minimum of 1 diameter, or 5 cemtimeters - 13.84cm. That's 5.44 inches. OK, a lot of numbers and fiddling. It's just to say that a safe margin of stability for this rocket has the center of gravity a lot further back than the instructions tell us. But... OK, I'm still kind of a n00b at this, and if you are too, it's better safe than sorry. As we saw above, a faster-flying rocket can tolerate overstability better than a slower-flying rocket. The margin on some fast, high power rockets is well over 2 caliber stability. And overstable is better than understable - so long as the rocket is flying fast enough and you're not launching on a really windy day. So, following the instructions is (usually) a better idea than not. Where my CG is is pretty safe - we've figured that out. But what if we're unsure? And what if we use a heavier motor, and the CG shifts backwards? How do we fix that? The answer is to add weight to the nose cone. Adding just a little bit of weight to a nose cone will shift the center of gravity forward and make the rocket more stable. It's not always a good idea to add too much nose weight, as you can get a really overstable rocket. But if you're unsure your rocket has basic 1 caliber stability, that's what you'll do. There are a number of ways of doing this. On a lot of model rockets, it's common to pack a bit of clay into the tip of the nose cone. The Big Dog - as well as the Quad Runner - suggest something different to add nose weight - the use of a lag screw and fender washer. This turned out to be necessary with the Quad Runner. Four C motors add a lot of weight to the aft of that rocket. The Big Dog, however, looks pretty good. To be safe, I added just the lag screw - leaving it halfway out so I could remove it if I want to. This lag screw looks loose, but it isn't. This shifted my center of gravity forward, so it was nicely at 9 1/2 inches from the aft of the airframe. The only other final touch, seen above, is to add a bit of masking tape - if necessary - to the shoulder of the nose cone, so that it fits snugly but not tightly into the airframe. You should be able to turn the rocket upside down without the nose cone falling out, but you should be able to get it out by hand with very little effort. This ensures it will stay on during flight, but eject properly when the motor ejection charge goes off. I put the nose cone on and slid it onto my rail launcher. The Big Dog is finally finished, and ready to fly. There are a number of ways of building a micro rail launch pad, or of mounting a rail to an already-existing pad with a rod. We'll talk about that at another time, but you can easily find solutions on The Rocketry Forum or the NAR Facebook page. I'm in the final week of rehearsals for my final show at the Bloomington Playwrights Project, the theater which is also responsible for me discovering rocketry. As a result, I've been rather too busy to blog much, so my final post in the mid power Quest Big Dog series will be out in a few more days - maybe a week. But I'm going to launch on Wednesday - and this time, I'll be lucky enough to launch at a farm! One of my fellow cast members has a huge place, and he's having us over for some rocket time. This is great news, because this will be the last time Chad will be in town before I move to Boston, so it will be our last launch together here in Bloomington. So I'll be pulling out all the stops, and launching everything I've got - including the Big Dog, the recently-built Estes Cosmic Explorer with an E motor mount, and the Quest Quad Runner - which I've had ready to go since December, but haven't wanted to risk losing on its maiden flight. Janus II with a camera payload bay. This also holds an altimeter. Aside from these new additions, I'll launch the rest of the current fleet as well. Pictures and video to follow! A few months ago, I raised some money for the Bloomington Playwrights Project. 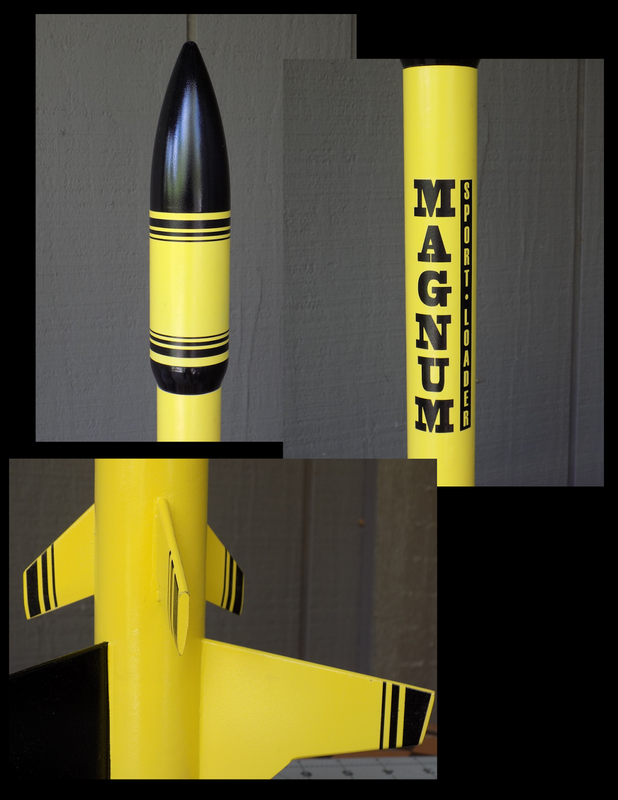 I offered rockets as an incentive to donate in my name - rockets designed and built by me. I managed to raise nearly $500 in the process! One donor in particular, Keith, gave me a significant donation, and so I offered to design him a rocket for his grandson, who's about 4 or 5 I think. At about 17.5 inches long, this rocket has forward-swept fins and a 5-inch long payload section. Once you get the fins on and the parts together, a rocket really starts to look like something. I think this might be my coolest-looking design so far. I like it so much, I think I'm going to have to build one for myself! But it needs a name. Right now, it's just called Keith's Rocket. It needs a better name than that. Any suggestions? At just over 16 inches long, this BT56-based rocket has a diameter of 1.35 inches, a long nose cone, and a wide fin span. The name "Donor's Rocket" just doesn't grab you. Most decals for rocket kits come in one of two types: waterslide decals and self-stick decals. You can also get custom decals made of vinyl or other materials, but for your basic kits, waterslide and self-adhesive are what you will see. Waterslide decals usually come on a slick backing paper, and appear to be stuck in place. You cut the decals out one by one, and place the whole thing - backing and all - in a bowl of water. In a few minutes, the decal becomes loose, and you literally slide the decal off the backing and onto the rocket. The adhesive soaks up the water and becomes slippery, and for a minute or so you are able to slide the decal around in place until you're happy with it, then pat it dry with a paper towel. The advantage of waterslide decals is that they are thinner, so they look more like they're a part of the actual paint job of the rocket. The waterslide decals on the Quest Magnum Sport Loader really look like part of the paint job. When well applied, they're unlikely to peel off. And they can be treated with various products so that they shrink into any crevices you may have to place them on (such as on a model airplane), so that they really look like a part of the model itself. Another advantage is that they are repositionable for a few minutes while wet, so if you don't get the decals perfectly placed on the rocket the first time, you are able to carefully slide it around until you're happy with it. If you finish the rocket with a coat of clear spray paint, you won't see any edges at all, and it looks great. The main disadvantage is that they're apt to tear if you're not careful, and if the decal happens to fold over and stick to itself while you're handling it, it's probably ruined. I was able to slide the pieces mostly together, there were some bits that were ruined. Self-stick decals are basically stickers. They go on, and they stick there. They're not terribly repositionable, but there is a trick you can use to get around that. They're thicker, and you can usually tell they're stickers - you can really see the edges. The self-adhesive stickers on my Estes Crossfire ISX. You can clearly see the raised edges of the stickers, and my feet. I really prefer waterslide decals, but there are some great kits which use self-adhesives, and the Big Dog is one of them. The main decal is one that wraps completely around the airframe, extends about nine inches down the body tube, and it's what gives the rocket its character. I was nervous about getting the large decal on straight, so I put it off a few days. Not a bad idea, anyway, to let your paint cure fully before applying anything sticky to it. If I'd gotten the decal on crooked, it would have looked lopsided - one side of the decal should be flush with the very end of the body tube, so I had to make sure I got it on just right. I wanted to check the decal to make sure it was the right size for the rocket - if you read my earlier posts, you know that some of the dimensions of the Big Dog don't add up - the centering rings were loose, and the fin marking guide was too short, because while the kit is in fact 1.97 inches in diameter, the box says it's 1.92 inches. I figured there'd be a gap in the decal - not a big deal, since it would be on the back side of the rocket, facing the launch rod - but I wanted to be sure. So I took a piece of paper and used it to measure the width of the decal, then I wrapped the paper around the body tube. The mark on the left is where the paper met up - the actual circumference of the rocket. The mark on the right is the right-hand edge of the width of the decal. The decal is too wide! This means that if I put it on the rocket as-is, the decal would overlap itself. I'm so glad I checked! I could have dealt with a gap, but I did not want the decal to overlap - overlapping could lead to peeling. I decided that trimming the decal was my only option. I laid the decal down on my cutting mat and taped it into place. I used the same piece of paper with which I'd measured the circumference of the rocket to make two pencil marks on the decal, telling me how much I needed to trim off. Then I lined those marks up with the back side of a metal ruler (to get a nice, straight cut), and taped the ruler in place - I did not want the ruler to slide around on the plastic decal while I was trimming it. I needed precision here! Then, with a very sharp, brand new hobby knife blade, I slowly and carefully trimmed off the excess. Most rocket kits are well-designed, but you do find some flaws now and again. It never hurts to check if you're unsure about a certain part or kit, and make some adjustments. Once you've built a few rocket kits, you'll know where you can safely stray from the instructions, and where you may need to make some changes for appearance, or even safety and functionality. I'm going to digress here for a moment, because I think it's important to know, especially if you're a fellow rocket n00b. Building kits, reading about how model rockets work, and building that knowledge base can sometimes help you avert disaster. On another Quest kit - the Quad Runner - I decided this was really necessary for the kit to work properly. You see, the centering rings which hold the motor tube in place have two functions. The first, of course, is to keep the motor in line with the center of the rocket. But centering rings also create a seal on the aft end of the rocket. When the rocket motor has used up all its propellant, there is a second charge - the delay grain - which burns slowly without producing any thrust, to allow the rocket to slow down before the parachute deploys. Finally, there is a third charge - the ejection charge - which creates a small explosion coming out the top of the motor, forcing hot gasses into the rocket body tube. This pressurizes the inside of the rocket, forcing the nose cone to pop out and allowing the parachute to deploy so the rocket can land safely. If your centering rings were full of holes, say, or there were some kind of gap between the motor tube and the airframe, some of that ejection gas would escape out the back. Meaning the airframe would not pressurize properly. If enough ejection gas leaked out quickly enough, that could mean that there would not be enough internal pressure inside the rocket to eject the nose cone. No ejection, no parachute. And since rockets are designed to fly nose cone first, the rocket would then take a nose dive at the Earth at incredible speed and hit the ground hard and fast, completely destroying the rocket. That seal at the back is very important. only place for ejection gasses to go is up inside the rocket airframe. The Quad Runner is a four-motor cluster rocket, so it has four motor tubes side by side, and because of that, its centering rings are different. They have clover-shaped cutouts to hold the four motors. This means that running down the center of the cluster of tubes is a diamond-shaped gap. To fill that gap and block ejection gasses from escaping, an additional, diamond-shaped piece is added to the motor mount. But I realized there was a problem. There was a little space between the tubes themselves - they were spaced slightly apart. And by looking at the measurements of the kit instructions, and actually peaking between the motor tubes themselves, I realized that the centering rings did not line up with the little diamond-shaped pieces in the middle of the motor mount. This mean that ejection gas could travel down the center of the motor mount, between the motor tubes, get around the diamond-shaped piece in the middle, then escape out the back of the rocket between the motor tubes. Now, it's quite possible that the gaps here are small enough that not enough ejection gas would escape out the back, and the rocket would be fine. But what if I had a nose cone that was a little snug? What if one or more of the motors didn't ignite, and there were fewer ejection charges going off? I wasn't going to take the risk of one of my more expensive kits taking a ballistic nose dive to oblivion. So, despite it's not being in the instructions, I decided the best solution was to fill in the gaps between the motor tubes themselves. I simply added a bead of glue to create a fillet. This sealed the gaps I was worried about, and would better ensure a successful recovery of the rocket. The point is, the more you know about rockets, the better able you are to recognize those few times when a kit manufacturer has made a design error - or when you yourself have made a building error - and to correct for those problems. In order to get the decal straight, I needed some kind of guide or reference. With a piece of aluminum angle, I drew a pencil guide line straight up the back side of the rocket, starting with the hole for the forward rail button. Self-stick decals will usually get permanently stuck wherever you lay them down, so if you place them incorrectly, you can't adjust them. But there's a trick you can use to get around this. Take a small bowl of water and add a little dish soap - a drop or two - and stir to dissolve. Before you stick the decal onto the rocket, dip the decal into the water. It will still stick to the rocket, but if you get it on crooked, you can peel it off without damaging the paint or the decal. The large wraparound decal is too large for a small bowl, so I used a large metal mixing bowl and added a full squeeze of dish soap. To make sure I'd gotten the ratio right, I first applied the small decals that went on the fins. I figured if I weren't able to peel these off, they'd still be relatively straight, and it wouldn't be crucial. I could add more dish soap to the water before doing the large wraparound. But I was able to peel and re-stick the fin decals, so it was a go. I was pretty sure I would be unable to get the wraparound decal on straight by myself. So I asked my girlfriend to hold the rocket for me. She held the rocket parallel to the ground, with the guide line on the back side facing me. I dipped the large decal into the soapy water, then lined one edge of it up with the guide line, making sure the end of the decal matched up with the end of the airframe. Then, slowly, she rotated the rocket while I pressed the decal into place, squeezing out air bubbles and pulling the decal taught to keep it straight. I had to peel and replace the decal a couple of times, but eventually, it went on straight. If there's a better, easier, or more accurate way to apply a wraparound decal, please let us know in the comments section! After applying the rest of the decals myself, I popped the nose cone on to have a look at the nearly-finished rocket. The Dupli-Color Cardinal Red paint I selected was not a good match for the decal - the Rust-Oleum Apple Red paint would have been much closer. This was my first time using lacquer paint, so I can't be sure, but I think the red paint on the nose cone darkened a little as it cured. This was when I discovered that I had already bought an extra can of Rust-Oleum Apple Red specifically for the Big Dog. Now I have a ton of red - guess I need to build some more rockets! Now, I'm pretty picky, so I do have to admit that this color mismatch does bother me. But other than that, and considering all the things that could have gone wrong on this build, not bad! The rocket is nearly finished - just a few more details before it's ready to fly. Click here for Part 12 - finishing up!